This apple strudel recipe brings memories of my childhood and the best version of this delightful dessert I have eaten to this day. My Austrian grandmother would make it from scratch, creating this amazing paper thin dough that was so large it would spill out over the sides of the table. Slowly she would roll up the many layers of this dessert treat and bake it into thin, crispy, sweet layers filled with apples or other fruit. Now we use convenient phyllo pastry. Combine the raisins and brandy and let stand overnight. Sprinkle the lemon juice over the grated apple. Add the sugar, flour, cinnamon and nutmeg. Mix well and set aside. Place 2 sheets of phyllo pastry on a damp towel, keeping the remaining pastry covered. Brush the pastry with 1 tablespoon of melted butter and sprinkle evenly with 1/4 cup of bread crumbs. Top with another sheet of pastry, brush with butter and sprinkle the bread crumbs. Repeat with the remaining pastry sheets. Drain the apple mixture. Spread the apple mixture over the bread crumbs, leaving 3/4 inch border on the narrow ends and a 1 inch border on 1 wide end. Sprinkle with the raisins and spices. Starting at the wide end without a border, roll up jelly roll fashion, and place on a greased cookie sheet, seam side down and tuck the ends under. Brush with 2 tablespoons of melted butter. Cut 1/4 inch deep slashes, about 1 inch apart, diagonally across the top. Bake at 375°F for 40 minutes or until golden brown. Sprinkle with powdered sugar. Serve each slice with a dollop of whipped cream or ice cream. 1. Cut down on the amount of sugar used in the recipe. Use 1/2 cup instead of 3/4 cup sugar. 2. Leave the top plain instead of covering it with powdered sugar. It will taste just as good. 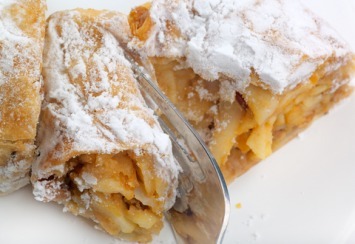 Apple strudel is a popular German recipe that is also well loved on this side of the world. Nowadays we shorten the laborious process of making this delectable dessert by using phyllo pastry instead of trying to make that paper thin dough from scratch. That alone saves so much time. You can use a multitude of fruit fillings, but apple seems to be the one most used and loved. This filling is a nice mix of apples, raisins and spices. The raisins are optional. Leave them out if you don’t like them, but they do add another level of sweetness, texture and taste. This recipe is certainly not quite Grandma Neumann’s (whose recipe we never did get), but it is delicious. 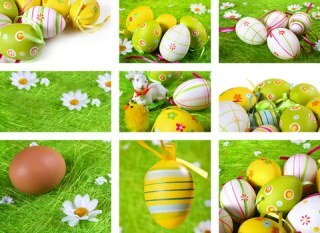 I think it could very well become one of your favorite things too, just like in the song. If you want the taste of apples but a quicker recipe than this apple strudel, have a look at our apple crisp recipe. Find all of our dessert recipes here.